What Do You Know about Black History? 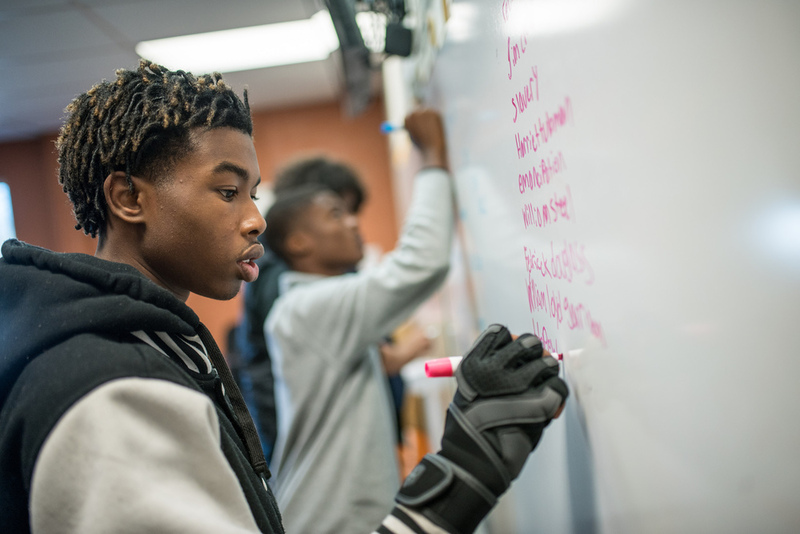 “Write everything you know about black history on the board,” was the opening exercise of the new Black History class offered to middle and high school students at the Academy for G.O.D. Rosemary Sherrod teaches Black History at the Academy for G.O.D. junior high and high school students. Her insatiable love of history, and in particular, black history, combined with her story-telling ability inspires students every class. The student body of the class is proportionally comprised of black and non-black students. On the board was written “Civil War,” “MLK,” “Abraham Lincoln,” “Rosa Parks” and “President Obama.” If I had prompted the students to recall other characters or events, they might have come up with a few more examples. However, in that moment, teacher and students alike looked at the whiteboard and realized that there is much to learn. And so we began, starting with slavery followed by abolitionism, emancipation, reconstruction, Jim Crowism, and Civil Rights. Those time periods, one extending for hundreds of years and another for a mere 12 years, were filled in with stories of people who refused to be silent, to look away, to be labeled as ‘less than,’ or to neglect his neighbor. Students heard the story of slavery from the writings of those who suffered during that time. Abolitionists, such as William Lloyd Garrison, Frederick Douglass and Sojourner Truth, taught students the way of liberation that is found in using our words, not our might. In an effort to understand Supreme Court cases that determined the fate of a nation of people, students acted as the legal representatives for the causes of Dred Scott and Homer Plessey in a mock trial debate. With passion and a sense of justice, they pleaded their case and when they heard the court’s discriminatory decision, they cried. They asked “why? !” They felt challenged to learn more so “that” history doesn’t repeat itself. “Can you imagine all of that in my mind? My head was just too full of black history, you know, the oppression that we went through,” Claudette stated as the reason why she just couldn’t get out of her seat. Claudette, a 15-year old student, sitting in a Black History class, went out the doors of her classroom and made a difference. Her story inspired the students in our class to realize they, too, have the ability to make a difference in this world. Midway through the semester, we did our whiteboard exercise again. “Write down everything you know about black history.” This time, there was little white space showing as the students filled the board with names and events that they understood. “I know so much about black history,” was the comment of one high school student as he put the marker down, stood back and looked at his list. Our Black History class is not about remembering ‘facts’ but hearing the stories of those who, for too long, have not had a voice in America’s history books or classrooms. In our Black History class, that voice is heard and the students are listening. Along with teaching this class, Rosemary Sherrod is the Director of the Hopewell Project. Her passion and commitment to make Hopewell a fun, safe and hospitable place for families stems from her wealth of knowledge on the history of Hopewell as a segregated neighborhood where blacks were kept from the quality of life she believes all people deserve. Rosemary is an ethnographer and has been compiling the largely untold story of Hopewell for the last few years. Newer PostI've Never Known Hunger. But I Witnessed it this Week.